Award-Winning Finalist in the "Performing Arts: Film, Theater, Dance, Music" category of the 2018 International Book Awards. A vast majority of Academy Award-winning Best Pictures, television movies of the week, and mini-series are adaptations, watched by millions of people globally. Great Adaptations: Screenwriting and Global Storytelling examines the technical methods of adapting novels, short stories, plays, life stories, magazine articles, blogs, comic books, graphic novels and videogames from one medium to another, focusing on the screenplay. 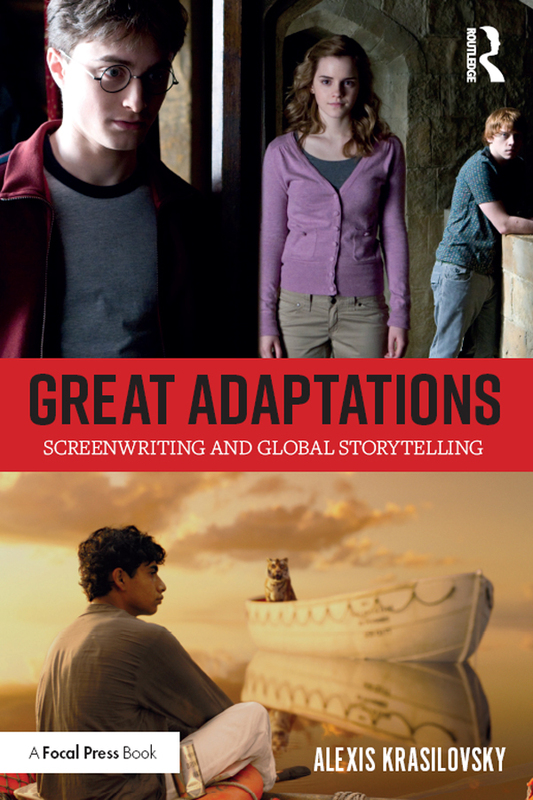 Written in a clear and succinct style, perfect for intermediate and advanced screenwriting students, Great Adaptations explores topics essential to fully appreciating the creative, historical and sociological aspects of the adaptation process. It also provides up-to-date, practical advice on the legalities of acquiring rights and optioning and selling adaptations, and is inclusive of a diverse variety of perspectives that will inspire and challenge students and screenwriters alike. "Great Adaptations: Screenwriting and Global Storytelling, by Alexis Krasilovsky, is a brilliant exploration of the genesis of some of the most potent ideas and stories from around the globe that have influenced countless film and television narratives – past and present. It’s inspirational and motivates the screenwriter to ideate on new narrative avenues that can explore the myths, legends, fables, fine ideas and literature that have fascinated mankind since the beginning of time. Krasilovsky explores global influences that have shaped the "male" story and the "female" story, emphasizes the importance of setting, time and place, and includes a multitude of supporting examples. This book must be included in every academic study on Adaptation and is a "must have" in every screenwriter’s toolbox." —Jule Selbo, Screenwriter, Author of Screenplay: Building Story through Character and Film Genre for the Screenwriter; Co-editor of Women Screenwriters, An International Guide. "Krasilovsky’s book provides a motherlode of broad-ranging insights into the art of adaptation, illuminating an essential truth about the sea of stories in which we all swim. It’s a book every screenwriter should read." 8 Structure: Heroes and Heroines – Where Are We Going? Alexis Krasilovsky is professor of Screenwriting and Media Theory and Criticism at California State University Northridge, teaching courses in Screenplay Adaptation and Film as Literature. Krasilovsky is a member of the Writers Guild of America, West, and was the writer/director of the award-winning global documentaries Women Behind the Camera (2007) and Let Them Eat Cake (2014). She is also the author of Women Behind the Camera: Conversations with Camerawomen (1997), and co-author of Shooting Women: Behind the Camera, Around the World (2015). Krasilovsky’s narrative film, Blood (1976), was reviewed in the Los Angeles Times as "in its stream-of-consciousness way, more powerful than Martin Scorsese’s Taxi Driver."